Uncle Flaviar loves local, unique, craft distillers, and Dry Fly out of Spokane, Washington, is after his heart. Why? Because these guys are what a craft distiller is supposed to be. Where some small shops outsource everything, reducing their business model to that of repackaging and marketing operations, Dry Fly is anti-that. They control every aspect of the process; from sourcing, 99% local ingredients from other local craft producers, to hand making everything else in their shop. They even hand-bottle all of their products on-site. And most importantly, they care about each and every step in the process and do have to answer to anyone except their own consciences. Dry Fly Distillers makes their signature Vodka and Gin, 100% Wheat Whiskey and their most recent addition: Bourbon 101. Not bad for a couple of corporate marketing refugees who combine forces to become the first licensed distillers in Washington since Prohibition. Their Bourbon was the first legal Bourbon ever made in the state of Washington! Distilled through twin, bespoke 450-liter Christian Carl copper-pot stills straight from Goppingen, Germany, Dry Fly Bourbon is made from a locally sourced mash of 60% corn (grown by a local Hutterian Settlement), and 20% wheat. Aged in 53-gallon barrels, this 4YO’s distinctively spicy profile earned it a Gold medal, 91 points, at the 2017 World Spirits Awards. The twin, bespoke 450-liter Christian Carl copper-pot stills traveled over seven thousand miles from Goppingen, Germany, to Dry Fly Distillery's home in Spokane, Washington. 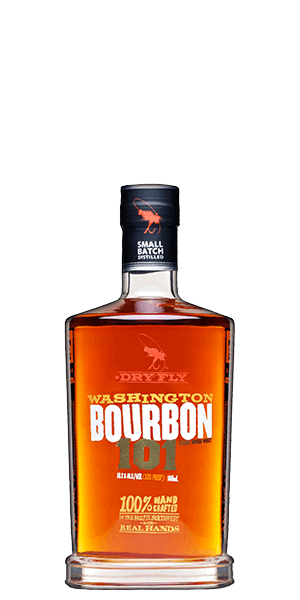 What does Dry Fly Straight Washington Bourbon 101 taste like? The Flavor Spiral™ shows the most common flavors that you'll taste in Dry Fly Straight Washington Bourbon 101 and gives you a chance to have a taste of it before actually tasting it. Subtle spice, vanilla and oak. Notes of caramel and toffee, offset by notes of clove and allspice mid-palate. To me this is just a very adequate bourbon...nothing special, but not bad either. Very bold. Very spicy with an aftertaste of oak and toffee. Tastes like bad medicine. Was not a fan at all. there’s not such thing as bad bourbon, but be aware that this one is SHARP. Warm, smooth, hints of clove and caramel. Easy on the dry, heavy on the fly. Washington can and should do better. Not a bad 101, definitely has a spicy kick mixed with cloves. Smoother than most mid to bottom shelf 101 Bourbons and Whiskeys. Good neat, interesting when mixed with a Dr. Pepper. A splash of water brings out more of the subtle notes. Not bad for a 101. Relatively smooth. Of the On the Bourbon Trail three, I would still give it to High West. Good with a bit of spice. Not my favorite but good and would drink again. This bourbon is just ok, did not stand out to me in any way. This selection offered an evening of conversation and debate as to what notes were detected. Wish we had a larger sample as it changed with every taste. Pretty solid, couple drops of water and it opened up to a smooth bourbon. Very smooth for a 101. Nice spice up front with a long semi sweet, vanilla, caramel finish. Love to buy a bottle and really explore, putting it on my wish list. My favorite out of the Off the Bourbon Trail box. Of the three in the box this one tasted the least like Bourbon, as I know it, to me. It tasted a bit hot and maybe a little too "woodsy" for my taste.